… just a little bit! The past couple of weeks have been a little insane with one week not very well at all and having to contend with payroll stuff for work then finishing off a pattern test and… my Illusions Quilt. Which I had a deadline for it to be received by Friday 25th. 1) Do not dither over a design for like forever. I must admit that not once I felt stressed or had a panic attack even though few times it looked close to not being finished. I guess this is a side effect of my job of Payroll Officer comes in I’ve trained myself to be calm and just get on with it. As Richard Cypher from the Sword of Truth series say “think of the solution and not the problem” Something I try to keep in mind.. mostly. Anyway……. ten minutes before we left to post it I finished the hanging sleeve (my first so fingers crossed it’s not too wonky!) but here are the rubbishy photos. 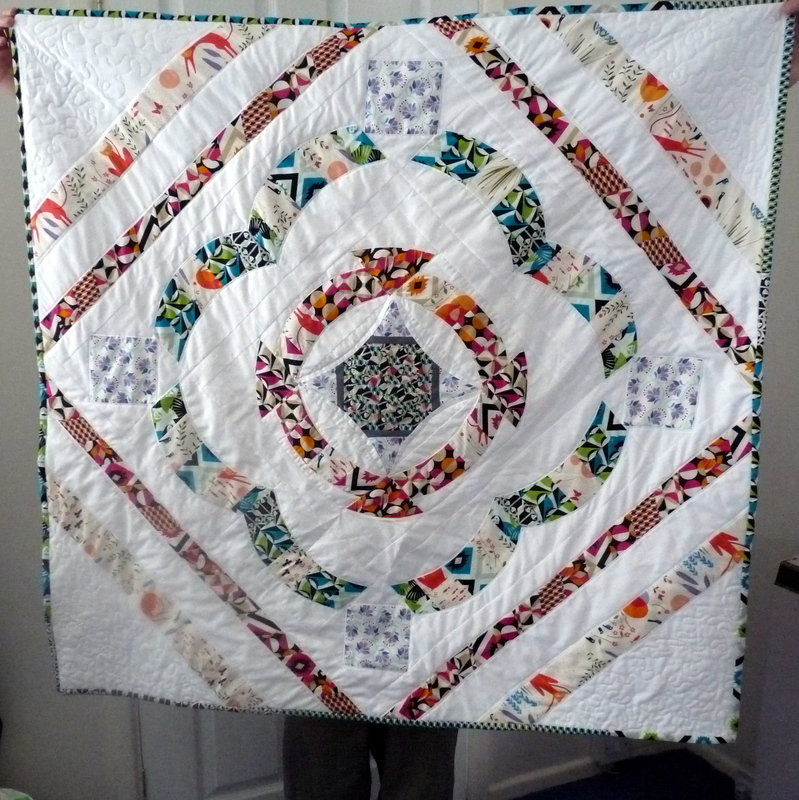 Just don’t look too close… the piecing… the quilting awful and the bottom right corner gah it’s all curvy and doesn’t hang straight down. Of course that doesn’t matter due to the wonky sleeve right?! One thing I did get right the fabric choices! Happy Sunday! I’m off to try and do something a bit slower..
You’re welcome, I hope I can get to see you at some point, even if it’s not at the show itself. I particularly liked your list of lessons learned 😉 Congrats on the finish!